As a child, going to the library with my mother was an awe-inspiring event. We mostly went during the summer when school was out. I remember it being cool and quiet. I felt very grown up because they had children’s books in a gated area with little chairs just my size. My mother would pull her library card out of the little envelope in her wallet, and we would be out the door with two books each for the week… and it didn’t cost money. By the time I reached fifth grade, my sister and I would be allowed to walk to the library by ourselves from my Oma’s house on Academy. We would “tight-rope” walk the rock retaining wall to the museum corner, cross over the stone steps and walk the wall the rest of the way to the library. The library building had the coolest steps, stacked like a square wedding cake. It also had the loudest clanging bell hanging over the door to announce our arrival to the librarian. “My little library” was on the corner of Coll and Magazine Streets. Though built in 1938, the Emmie Seele Faust Memorial Library can trace its roots back to the 1920s. Early libraries in Europe were mostly operated by churches and academic institutions. Commercial libraries were basically “members only” by annual subscription to the wealthy and privileged. Free public libraries were unknown. Benjamin Franklin founded the first subscription library in North America in 1731. The first free public library supported by taxation in the world was the Peterborough, New Hampshire library founded at a town meeting on April 9, 1833. As population grew and technology changed, the push for truly public libraries, paid for by taxes and run by the state, gained force. The growth of women’s literary societies and cultural clubs in the late 1800s provided the volunteer power needed to form public libraries. One such group, The Delphian Society, was a national organization founded in 1910 by a group of scholars from all over the U.S. and England that offered women in-home study courses. It soon became a group-study course, with chapters popping up in cities and small towns all over the country. Women met to discuss the recommended books and fine arts courses, including history, literature, philosophy, poetry, fiction, drama, art, ethics, and music. The New Braunfels Chapter of The Delphian Society formed in about 1924. In their third season, September 1927, the members launched a drive for a public library. By March of 1928, The Delphian library committee, along with members from other local organizations, formed the New Braunfels Public Library Board led by Mrs. M.C. Hagler. The Board worked diligently, hosting book “showers”, musical programs and other campaign fundraisers to gather books and establish the needed funds. The new library opened on June 15, 1928, at 173 S. San Antonio Street, in space donated by Mrs. Landa. On April 5, 1929, the New Braunfels Herald announced that the public library collections moved into the Landa Offices Building on Main Plaza. At that time, the price of a subscription to participate was $1.00 per year. It was open to the public, but still not truly free. Our nation entered into the Great Depression, but the Library Board worked on. In October of 1933, the public library moved into the library room of the newly built Sophienburg Museum. By 1937, it was clear that the library needed its own space. The possibility of a new public library building for the city of New Braunfels got closer in October 1937. Mrs. Emmie Seele Faust, daughter of Hermann Seele, the Father of Public Education in Texas, offered a large donation to build a memorial library on the site of Market Square. The property owners surrounding the square protested the building of a library in their neighborhood. The Sophienburg Memorial Association eventually donated a parcel of the Sophienburg Hill property for the new library, with the understanding that when it ceased to be a library it would revert back to the Association. The same architect that designed the Sophienburg Museum, Jeremiah Schmidt, designed the library with a beautiful white rock façade and red tiled roof. It was built, by Edwin Hanz, with rock retaining walls and stepped entrance to match the landscaping of the Sophienburg Museum. The Emmie Seele Faust Memorial Library opened in the fall of 1938. It should be noted that in the 1930s, of the 254 counties in Texas, only 19 had free public libraries. The “Emmie” was ahead of her time. The Emmie Seele Faust Memorial Library served the city of New Braunfels for 30 years before the city built the Dittlinger Memorial Library on adjacent property in 1968. The city then built the current New Braunfels Public Library on Common Street in 1999. The old Emmie Seele Faust Library building was utilized by the Sophienburg Museum for artifact storage and as the archives for a number of years. Restored to its former glory with generous donations in 2011, the Emmie Seele Faust Memorial Library is now used for educational programming and as a small event venue, fulfilling again its intended use as a public space. Eighty years after the Emmie Seele Faust Memorial Library opened as the free public library for the City of New Braunfels, it has been recognized by the Texas Historical Commission as a Recorded Texas Historical Landmark. All of us who think of the Emmie Seele Faust Memorial Library as “my little library” can be proud of those first forward thinking women and their determination to bring civic education and culture. Look how far we have come. The Comal County Historical Commission is hosting a marker unveiling and dedication to be held in front of the library on 401 W. Coll Street on Sunday, April 8 at 4pm. Coincidently, April 8th marks the beginning of National Library Week. All are invited. 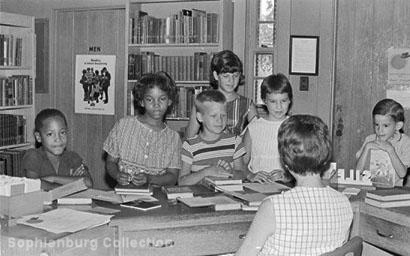 School children at the front desk in Emmie Seele Faust Memorial Library, corner of Coll and Magazine, circa 1965.